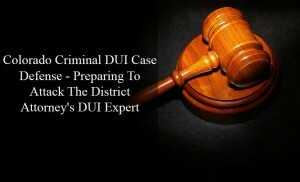 Colorado Criminal DUI Case Defense – Preparing To Attack The District Attorney’s DUI Expert – In many Colorado DUI prosecutions the County Deputy District Attorney will call a so called “expert” on the effects of alcohol on the human body, the intoxilizer machine, the impact of marijuana on the body and more. This article addresses the methods used by experienced effective Colorado criminal defense lawyers to attack these witnesses when they testify in these cases. If the expert refuses to speak to you – unlikely of course – make a note of what he or she says – when the conversation took place and how long it lasted. Address it in cross examination at trial. Do a basic Internet search. Look for web sites stating qualifications – curriculum vitae – any biases – and any statements about their ability in their field. Look for specific cases – trials at which they testified. Look for prior testimony or lectures that establish narrow thinking or bias as regards their professional opinion. Include social web sites – Facebook, Linked In, Twitter and Instagram. Certifications and memberships may mean nothing more than attending one seminar and paying a fee – or joining an organization and paying it’s dues. “Backgrounding” an expert uncovers what is actually necessary to obtain the certification. Do your homework many certifications are “trumped up.”. The public writings and all publications that have been authored by an alleged expert witness are fair game and another source of information. If the DA asks an expert witness at trial to offer an opinion – prior opinions offered in other trials or other contexts might be a great source to contradict the prosecutor’s present expert opinions. Compiling a series of printed transcripts and articles – public appearances – and private lectures featuring the expert can ALL be used to impeach the credibility of the expert. Here nothing but a thorough review these publications and appearances will yield the material you may need. Have The Expert’s Publications Been “Peer Reviewed”? Peer review is a process where certain types of scientific articles are analyzed by other scientists before being approved for publication in a scientific journal. Experts often publish articles in support of their opinions. If the expert’s articles have not been “peer reviewed” and were just “published” in a magazine dedicated to one sided thought, this can be an area of attack at trial during cross examination. An experienced criminal defense lawyer has the obligation to learn as much as possible about “the science” underlying the State’s expert opinions. A lawyer must know more than the basics of the science involved – he or she must master it. Only mastery of the technical aspects of the area in question produces the kind of effectively questions on cross that willmake a difference in the case. This Rule – Rule 705 -permits a Colorado criminal defense lawyer to cross-examine the State’s DUI and all other experts on the “underlying basis” of that expert’s opinion. The soft underbelly of the state’s expert is the question whether the opinion expressed in front of the jury is based on science and sound principle – or is that opinion a bald “conclusion” based only on personal opinion? If an expert makes assumptions that are not grounded on anything more than guesses or theories, that fact must be exposed to the jury. If an expert opinion is the “minority” opinion in their field the criminal defense lawyer must expose that fact by complete mastery of the field. Assumptions must be exposed untrue or inaccurate and the DA must not be allowed to argue that opinion unchallenged in closing argument. The Colorado criminal defense lawyer should never accept the DA’s experts background with out establishing the truth or falsity of that alleged expertise. A Motion In Limine can be filed to compel the full nature of the expert’s qualifications on the record in advance of trial. The motion is intended to either preclude or to limit an expert’s proffered testimony by challenging the witness’s lack of qualifications or the misapplication of the expert’s knowledge to this particular case. The facts or data in the particular case upon which an expert bases an opinion or inference may be those perceived by or made known to him at or before the hearing. If of a type reasonably relied upon by experts in the particular field in forming opinions or inferences upon the subject, the facts or data need not be admissible in evidence in order for the opinion or inference to be admitted. Facts or data that are otherwise inadmissible shall not be disclosed to the jury by the proponent of the opinion or inference unless the court determines that their probative value in assisting the jury to evaluate the expert�s opinion substantially outweighs their prejudicial effect. This rule – assures that the facts and or data relied upon by the expert must be of a type that are “reasonably relied upon by experts in the particular field in forming opinions or inferences upon the subject.” While the underlying information relied upon by the expert need not be admissible in its own right – it can be attacked as on an individualized basis to expose flawed assumptions that the expert has relied upon in reaching his or her opinion. Did the witness properly apply the scientific formulas? What data or evidence did the witness rely upon (or ignore) to reach their conclusion? Does the expert market himself as a prosecution only witnesses? Has the expert ever testified before for the State? Does the expert list organizations he is affiliated with and received accreditation from? What data or evidence did the defense expert rely upon? A good example of the importance of attacking expert testimony in DUI caes is the issue of establishing the Blood Alcohol Level at the time of driving. The District Attorney is charged with the responsibility of proving you were either DUI (intoxicated) or DWAI (impaired) by alcohol at the time you were driving. The state often uses an expert to perform a calculation based on formulas relied upon by other experts in the field of forensic toxicology. If a traffic stop occurs soon after one has had alcoholic beverages that person’s blood alcohol level is still rising. Therefore, the person’s blood alcohol concentration (BAC) may well have been below .05% (DWAI) or .08% (DUI) at the time of the stop. This may be true EVEN IF THE TEST WAS ABOVE THOSE LIMITS AT THE POLICE STATION. Because only your BAC awhile you were driving or at the exact time you were stopped is relevant attacking a prosecutor’s expert and retaining our own expert to “battle” the DA’s expert might mean the difference between winning and losing a DUI. Prosecution experts are typically criminalists or forensic toxicologists that work for the local county. Juries can be made to understand that prosecutors and law enforcement experts use the same person again and again and they always testify in the same manner with very little variation. In that sense – these “government employees” (it can be argued) are no more than “hired guns” whose positions with the state depend upon giving the “right answers” to the prosecutor’s questions. Obtaining transcripts of the prior testimony of these experts can yield substantial cracks in the objectivity of their testimony. Their qualifications are often out of date, and their opinions may be attack able based on new research in the field. Furthermore, an experienced Colorado DUI Defense Lawyer can help you to make the decision to retain a defense expert/forensic toxicologist in your DUI cases. An expert whose credentials and experience can provide the for the jury the kind of insight and information that can strategically decide the issue of BAC levels at trial. If you are charged with A Colorado crime or you have questions about Criminal DUI Case Defense – Preparing To Attack The District Attorney’s DUI Expert, please call our office. The Law Offices of H. Michael Steinberg, in Denver, Colorado, provide criminal defense clients with effective, efficient, intelligent and strong legal advocacy. We can educate you and help you navigate the stressful and complex legal process related to your criminal defense issue. Colorado Defense Lawyer H. Michael Steinberg provides solid criminal defense for clients throughout the Front Range of Colorado – including the City and County courts of Adams County, Arapahoe County, City and County of Boulder, City and County of Broomfield, City and County of Denver, Douglas County, El Paso County – Colorado Springs, Gilpin County, Jefferson County, Larimer County, and Weld County,…. and all the other cities and counties of Colorado along the I-25 Corridor… on cases involving .. Colorado Criminal DUI Case Defense – Preparing To Attack The District Attorney’s DUI Expert.